Grace Ibay has been a freelance writer and blogger since 2005, specializing in the medical sciences and health care. She worked at Johns Hopkins University and the National Institutes of Health as a research associate and has been published in various scientific journals. Ibay holds a master's degree in health science from Johns Hopkins University in Maryland. One percent of the U.S. population reports an allergy to peanuts or tree nuts, including cashews, according to a study published in the 2012 issue of "The Journal of Allergy and Clinical Immunology." Symptoms of cashew allergy involve the skin, gastrointestinal and respiratory systems. In recent years, cashew allergy has received more attention as a serious condition. Although peanut allergies remain more common, cashew allergies may pose a greater risk of anaphylactic shock, a life-threatening allergic reaction, according to a October 2005 study published in "Archives of Disease in Childhood." When your body is exposed to an allergen -- a substance that leads to an allergic response -- excess amounts of histamine are produced. While small amounts of histamine help the body's immune response, large quantities are responsible for many of the severe reactions to allergens. 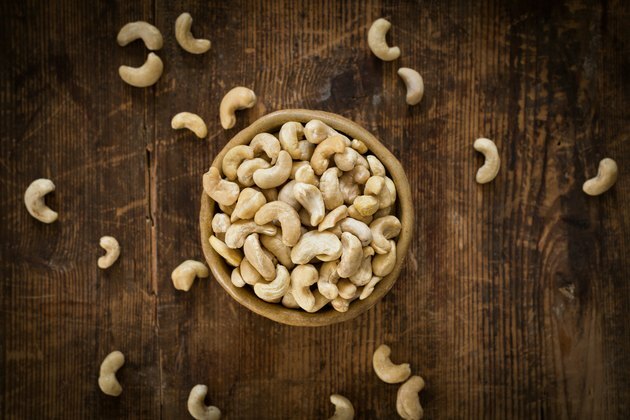 Initial symptoms may be itching or tingling in or around your mouth, and these symptoms can appear within minutes of eating or touching cashew or food with cashew ingredients. Skin lesions, including hives and swelling are common. Raised, red, itchy welts of various sizes may appear at random on your skin. An allergic reaction to cashew may cause symptoms of hay fever or asthma when cashew nut allergens are inhaled or consumed. Runny or stuffy nose, itchy eyes, nose, itching on the roof of your mouth and coughing are common respiratory symptoms. Wheezing or whistling sounds heard with breathing out is a sign of constricted airways. Other symptoms may include shortness of breath, tightening of the chest and chest pains. People allergic to cashews may also experience stomach cramps or vomiting. More severe symptoms may include diarrhea, projectile vomiting, difficulty swallowing or nausea. A swollen tongue or throat may block your airway or may be a sign of swelling inside your digestive tract. Cashew allergy may be more likely to cause a severe allergic reaction called anaphylaxis compared to peanuts, and according to the review in the June 2014 issue of "Allergy," even skin and mouth contact can lead to anaphylaxis. Symptoms of this potentially fatal crisis include rapid pulse, swelling of the throat that prevents breathing, constriction of the airways, fainting, lightheadedness and loss of consciousness. Ingestion or inhalation of even small amounts of cashew may elicit an anaphylactic shock. Anaphylaxis develops suddenly and becomes life-threatening quickly, so it is important to seek immediate medical attention. If you have an allergy to cashews, you may also be allergic to pistachios, since these are in the same plant family. In addition, people with cashew allergies are more likely to be allergic to other tree nuts, such as walnuts or almonds. Cashew allergy symptoms can be severe and life-threatening, so see your doctor or allergist for an evaluation and treatment, and for clear guidance on which foods you need to avoid.